Place: Albuquerque, New Mexico, U.S.A. The word yoga, first recorded in approximately 4000 BCE, is Sanskrit for 'union'. Typically it signifies a uniting of body, mind, and spirit leading to deepening states of happiness and freedom. This book places this ancient practice in a uniquely modern-day context. Interwoven with discussions about the eight limbs of yoga as presented in the original literature, including the core principles, Sanskrit Devanagari, mantras, poses, breath work, and meditation, are recipes, a derivation of terms, compassion ate communication guidelines, basic teaching principles, wisdom and photos of the great sages, and illuminating accounts by contemporary yogis. Throughout, readers are guided to connect to their inner selves, quiet the mind, and harness their power to achieve bliss and transcend fear, emotional turmoil, and attachment to the stresses of life. This informative reference features a highly visual format, including a first-ever historical timeline of yogic philosophies, texts, and key figures. Introduced too is yoga therapy for everything from low back or knee pain to depression. Each chapter concludes with specific invitations to delve further into the heart of yoga. 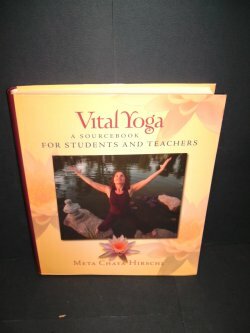 Designed to enrich any chosen style of practice, this book is ideal not only for yoga students and aspiring yoga teachers but also for healing arts practitioners and their patients, as well as anyone seeking to cultivate a vibrantly healthy body, mind, and spirit. Slight crease to bottom edge of cover otherwise new. 300pp.